Born and raised in the prairie provinces of Canada, Shawn has (since a young age) had a deep love for Jesus and His Word, His church, and for faithfully exploring and communicating the scriptures in ways that are accessible, practical and alive. 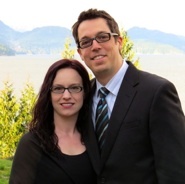 With a hunger for the deeper life in Christ, in his role as Lead Pastor of Rockyview Alliance Church in Calgary, Alberta, Canada, Shawn has a desire to see others growing in their discovery and knowledge of Christ. At home, Shawn and his wife Gini are finding joy in the journey of raising three young children, and as time permits – Shawn loves to ride motorcycles, work the garden at home, or as of late, he can be found jumping on the family’s trampoline with (or without) his kids. Jesus said in John 10:27, “My sheep listen to my voice, I know them, and they follow me…” If Jesus has a voice, if He speaks, and if He says that His disciples can hear and follow His voice, why do so many disciples seem to struggle to listen and hear God’s voice? This course will look intently and practically at how God speaks, how you can hear Him, and what it looks like in practice to listen and respond to the voice of God.